*Article was trending at FoxNews.com in the early days of the 2018 Iran uprising. *The National Interest is the leading journal associated with the realist school of foreign policy and is published by the Center for the National Interest, chaired by Henry Kissinger. The article, which was a leading article at the magazine during the 2018 Iran uprising, was coauthored with University of Michigan Professor Emeritus Raymond Tanter, a member of the National Security Council senior staff in the Regan White House. The article was subsequently translated into Farsi by Voice of America – Iran (VOA Farsi). *The article was also translated into Farsi by Voice of America – Iran (VOA Farsi) and republished. *Published in print and online versions of National Post. *Article received ~11,500 direct Twitter shares in less than a week. *This 7,000+ word study is among the most comprehensive analyses of the Iran protests in print. *On May 2, 2018, Sheehan’s analysis was referenced in official testimony in the Canadian Parliament by leading Iran policy scholar and President of the Foundation for the Defense of Democracies, Mark Dubowitz. Sheehan was also cited by the editor of The Washington Free Beacon. *The National Interest is the leading journal associated with the realist school of foreign policy and is published by the Center for the National Interest, chaired by Henry Kissinger. The article, which was a leading article at the magazine during the 2018 Iran uprising, was coauthored with University of Michigan Professor Emeritus Raymond Tanter, a member of the National Security Council senior staff in the Regan White House. 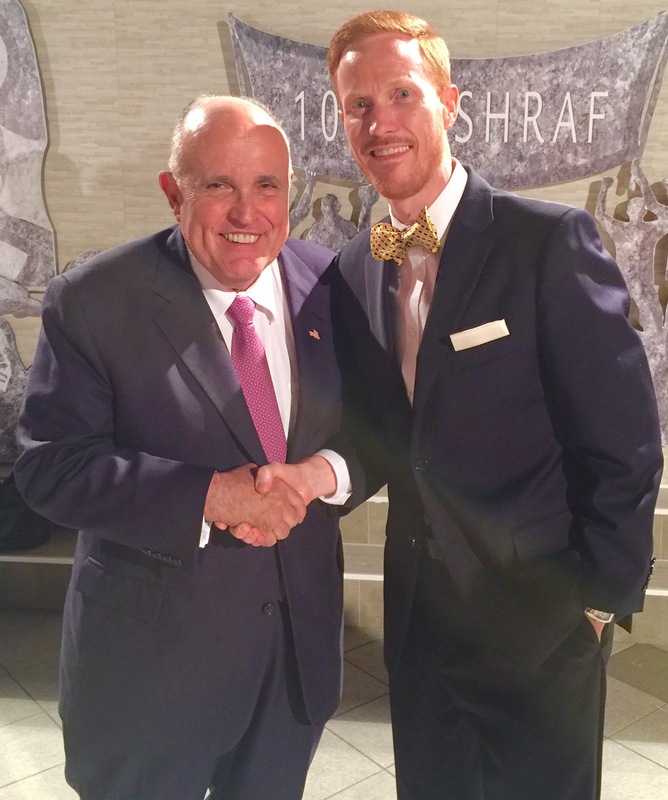 In June 2018, Dr. Sheehan traveled to Paris as part of a research delegation examining the Iranian opposition as protests swept over Iran. Sheehan’s policy-oriented writing, scholarship, and media appearances – as well as analyses provided to policymakers in the U.S. Congress – have examined matters related to regime change in Iran. On June 29, 2018, Sheehan participated in radio, print, and television media in Paris, including interviews with talk show host Mike Siegel (syndicated by Genesis Communications Network), Al Arabiya, Iran National Television, and the National Council of Resistance of Iran. Dr. Sheehan also spoke, on background, for reporting carried out by POLITICO. The Paris conference, carried live in the U.S. by Fox News and The Washington Times, was also broadcast inside Iran by Voice of America and featured prominently in many Arab newspapers. Dignitaries in attendance included former Speaker of the U.S. House of Representatives Newt Gingrich; former FBI Director Louis Freeh, former Secretary of Homeland Security Tom Ridge; former U.S. Attorney General Judge Michael Mukasey; former National Security Advisor to President George W. Bush, Frances Townsend, and many others. Breaking news following the event indicated that the rally had been targeted by agents of Iran’s Ministry of Intelligence (MOIS) in a terror plot thwarted by authorities in Belgium, France, Germany, and Austria who worked together to foil the bombing. Five individuals, including an Iranian diplomat, who was reportedly working as an MOIS Station Chief in Vienna, were arrested after being trapped with explosives and a detonator. The plot was immediately reported on by The New York Times, Wall Street Journal, Reuters, and NBC and addressed by senior U.S. State Department officials. In summer 2018, Dr. Sheehan was also invited to join select, senior former U.S. officials – including Speaker Newt Gingrich, FBI Director Louis Freeh, and Attorney General Michael Mukasey – as a signatory to an open letter published in the The New York Times in support of Iranian protesters promoting democracy in Iran. Sheehan was also invited to join a group of select, distinguished U.S. officials as a signatory to an official letter sent to Secretary of State Mike Pompeo on the foiled terror plot launched by the Iranian Ministry of Intelligence (MOIS) that targeted the rally for democracy in Iran held in Paris. Dr. Ivan Sascha Sheehan is the Executive Director of the School of Public & International Affairs at the University of Baltimore. 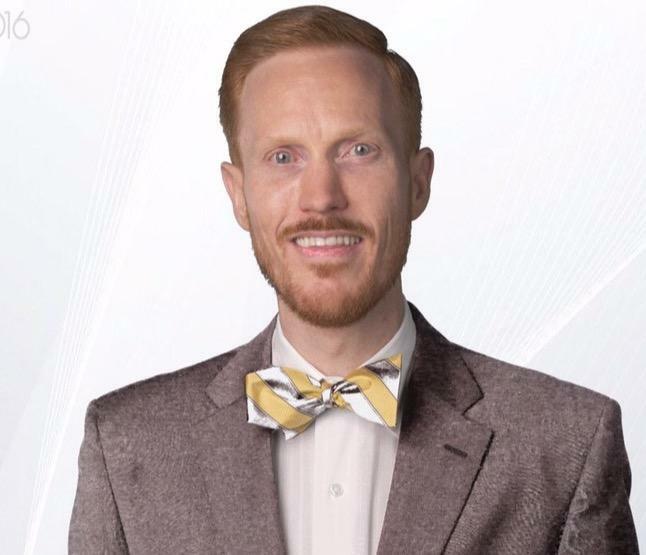 For research or media related updates or to learn more about Dr. Sheehan, follow him at @ProfSheehan or link to his research profiles. In the first three weeks of 2018, Dr. Ivan Sascha Sheehan – Associate Professor of Public and International Affairs – published six op-eds in prominent news outlets, including Fox News and The National Interest. In summer and fall 2017, Dr. Sheehan also authored seven additional op-eds that circulated in Washington’s policy community and raised themes subsequently picked up by prominent U.S. officials in public remarks and prior to important votes. In November 2017, Sheehan also spoke at the National Press Club at an event with Senator Joseph Lieberman. *The article was trending at FoxNews.com in the early days of the 2018 Iran uprising. *The National Interest is the leading journal associated with the realist school of foreign policy and is published by the Center for the National Interest, chaired by Henry Kissinger. The article, which was a leading article at the magazine during the 2018 Iran uprising, was coauthored with University of Michigan Professor Emeritus Raymond Tanter, who served on the National Security Council senior staff in the Regan White House. The article was subsequently translated into Farsi by Voice of America – Iran (VOA Farsi). 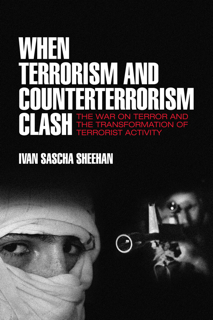 In winter 2017, Dr. Sheehan was also profiled in a magazine article titled Professor Ivan Sascha Sheehan Zeroes in on Conflict Both at Home and Abroad. Dr. Sheehan is the Vice Chair of the Board at the American Committee on Human Rights (formerly known as the Iran Policy Committee). The organization, which educates policymakers on U.S. Iran policy, is made up of senior former White House, State Department, Pentagon, and CIA officials, as well as scholars from think tanks and academia. Sheehan’s scholarship, policy-oriented writing, and media appearances have been influential in shaping Washington’s thinking on the prospect of a democratic transition in Iran. Dr. Sheehan is scheduled to appear at the Policy Studies Organization’s 2018 Middle East Dialogue this spring and anticipates presenting at the 2018 annual conference of the American Political Science Association in the fall. Dr. Ivan Sascha Sheehan is the Director of the graduate programs in Negotiations & Conflict Management and Global Affairs & Human Security in the College of Public Affairs at the University of Baltimore. For research or media related updates or to learn more about Dr. Sheehan, follow him at @ProfSheehan or link to his research profiles. On November 21, 2017, Dr. Ivan Sascha Sheehan – Associate Professor of Public and International Affairs – spoke at The National Press Club in Washington, D.C. 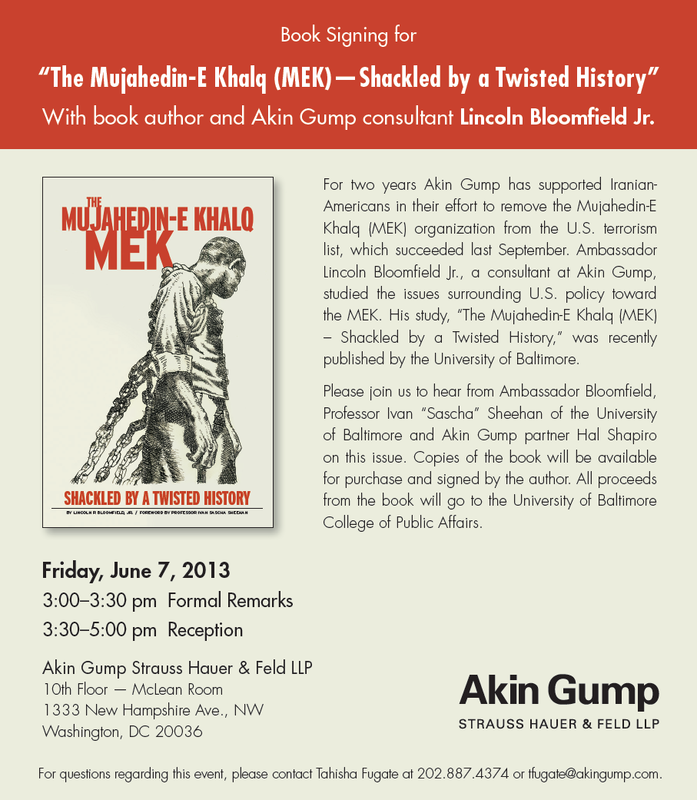 The event, which featured Senator Joseph Lieberman and General Charles F. Wald, was covered by media from around the world, including Voice of America (English and Farsi), The Weekly Standard, Breitbart, and several Arab dailies. Dr. Sheehan was quoted in an article titled “Experts: ‘Persian Spring Is Possible’ in Oppressed Iran” and was also quoted by the Deputy Managing Editor at The Weekly Standard. Dr. Sheehan is the Vice Chair of the Board at the American Committee on Human Rights (formerly known as the Iran Policy Committee). The organization, which seeks to educate policymakers on U.S. Iran policy, is made up of senior former White House, State Department, Pentagon, and CIA officials, as well as scholars from think tanks and academia. Dr. Sheehan is the author of a number of influential recent op-eds on U.S. Iran policy. Dr. Sheehan’s scholarship, policy-oriented writing, and media appearances have been particularly influential in shaping Washington’s thinking on the prospect of a democratic transition in Iran. This fall Dr. Sheehan also participated in the NASPAA NEXT Leadership Development Workshop, an invitation only workshop for higher education leaders in public affairs. The meeting focused on strategies for communicating groundbreaking research to public policy officials. Dr. Sheehan also chaired a bipartisan panel discussion featuring elected officials at the annual conference of The William Donald Schaefer Center for Public Policy. UB Magazine also profiled his work in an article titled Professor Ivan Sascha Sheehan Zeroes in on Conflict Both at Home and Abroad. 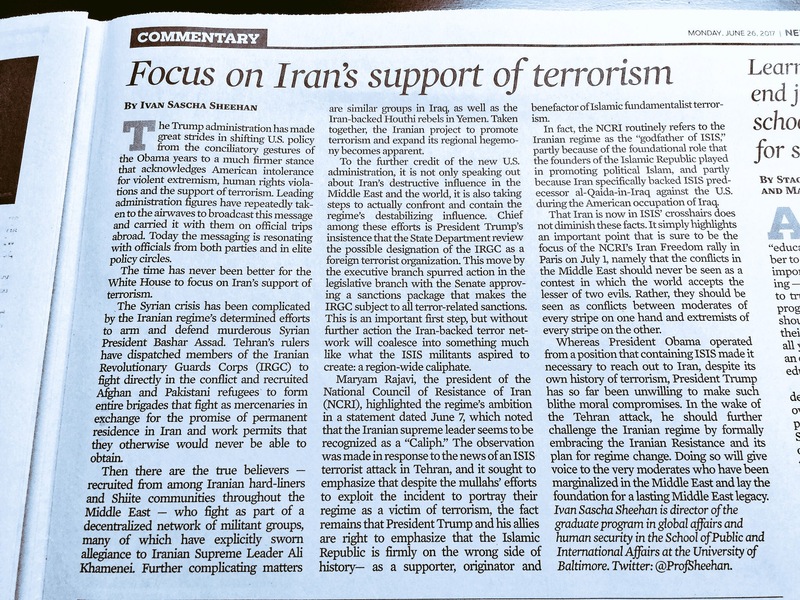 On August 4, 2017, Dr. Ivan Sascha Sheehan – Associate Professor of Public and International Affairs – authored an op-ed in the congressional newspaper The Hill on the value of the bipartisan passage of the sanctions legislation directed at Iran, North Korea, & Russia. The Countering America’s Adversaries Through Sanctions Act of 2017 (H.R. 3364) passed through both chambers of the U.S. Congress with more support than almost any piece of major legislation in recent memory. Dr. Sheehan’s scholarship on regime change, policy-oriented writing, and media appearances have been influential in shaping Washington’s thinking on the prospect of a democratic transition in Iran and curtailing Tehran’s state-sponsored terrorism through sanctions and support of the Iranian opposition. 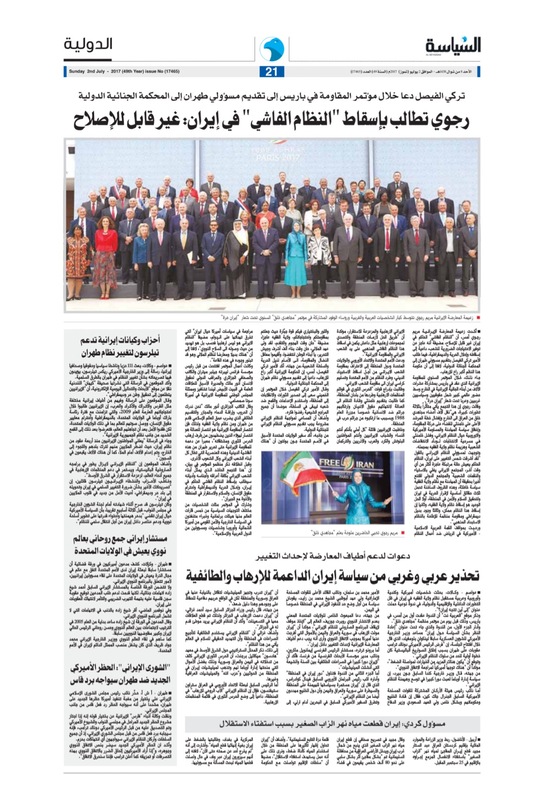 Dr. Sheehan‘s article in New York Daily News was published on the second anniversary of the conclusion of negotiations that resulted in the Joint Comprehensive Plan of Action with Iran (JCPOA) and proposed a formal shift in U.S. policy consistent with American national security interests and Department of State rhetoric. Learn more here. In the article that follows, Dr. Sheehan was invited by the French newspaper La Tribune to weigh in on the Trump-Macron summit in Paris. The op-ed was translated into French as the heads of state met in private and shared with U.S. and E.U. dignitaries. Read the original article in English here and learn more here. Dr. Sheehan also published two widely circulated articles in June that addressed terrorism and U.S. policy in Middle East, including one in The Baltimore Sun. Each of the the policy-oriented commentaries were in keeping with remarks that Dr. Sheehan made at a panel discussion for U.S. officials in Europe earlier this summer where he spoke alongside former Secretary of Homeland Security Tom Ridge and joined a distinguished international research delegation. This past June, Dr. Sheehan also served as the Moderator for the National Geographic Channel premiere of Hell on Earth: The Fall of Syria & the Rise of ISIS in Washington, D.C. The documentary – by Academy-Award nominated filmmaker and New York Times #1 best-selling author Sebastian Junger and Emmy award winner Nick Quested – traced the origins of the Syrian crisis and the rise of Islamic State. In June Dr. Sheehan also delivered a keynote address at a think-tank in Paris, France and co-authored a Citiciscope article. In mid July 2017, Dr. Ivan Sascha Sheehan – Associate Professor of Public and International Affairs – authored two additional op-eds on U.S. policy in the Middle East. Dr. Sheehan’s scholarship on regime change, policy-oriented writing, and media appearances have been influential in shaping Washington’s thinking on terrorism, the Iranian opposition, and the prospect of a democratic transition in Iran. The first article in New York Daily News was published on the second anniversary of the conclusion of negotiations that resulted in the Joint Comprehensive Plan of Action with Iran (JCPOA) and proposes a formal shift in U.S. policy consistent with American national security interests and Department of State rhetoric. In the second article Dr. Sheehan was invited by the French newspaper La Tribune to weigh in on the recent Trump-Macron meeting in Paris. The op-ed was translated into French as the heads of state met in private and shared with U.S. and E.U. dignitaries. Read the original article submitted in English here. The policy-oriented commentaries are in keeping with remarks that Dr. Sheehan made at a panel discussion for U.S. officials in Europe earlier this summer where he spoke alongside former Secretary of Homeland Security Tom Ridge and joined a distinguished international research delegation. Dr. Sheehan also published two widely circulated op-eds in June that addressed terrorism and U.S. Policy in Middle East. In July 2017, Dr. Ivan Sascha Sheehan – Associate Professor of Public and International Affairs – traveled to Paris as part of a distinguished research delegation examining the Iranian opposition in the lead up to the second anniversary of the Joint Comprehensive Plan of Action with Iran. 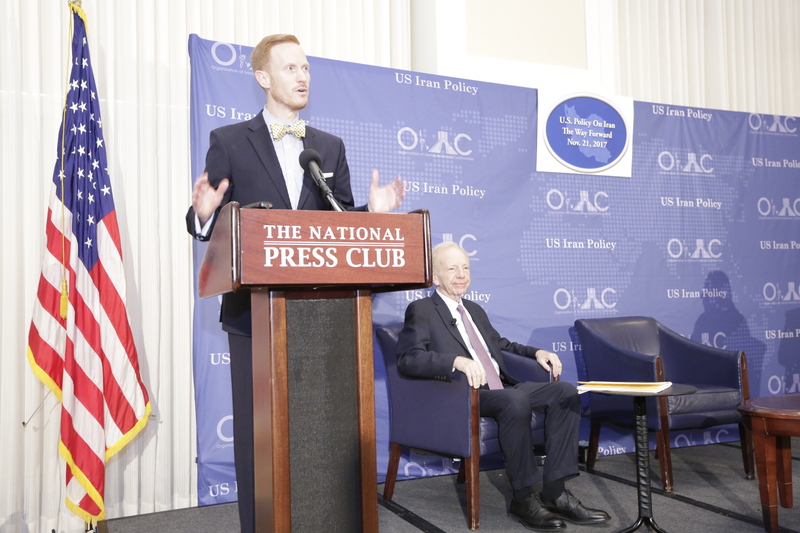 The theme of the conference – regime change in Iran – was consistent with Dr. Sheehan’s policy-oriented writing, scholarship, and media appearances, as well as analyses he has provided to policymakers in the U.S. Congress. 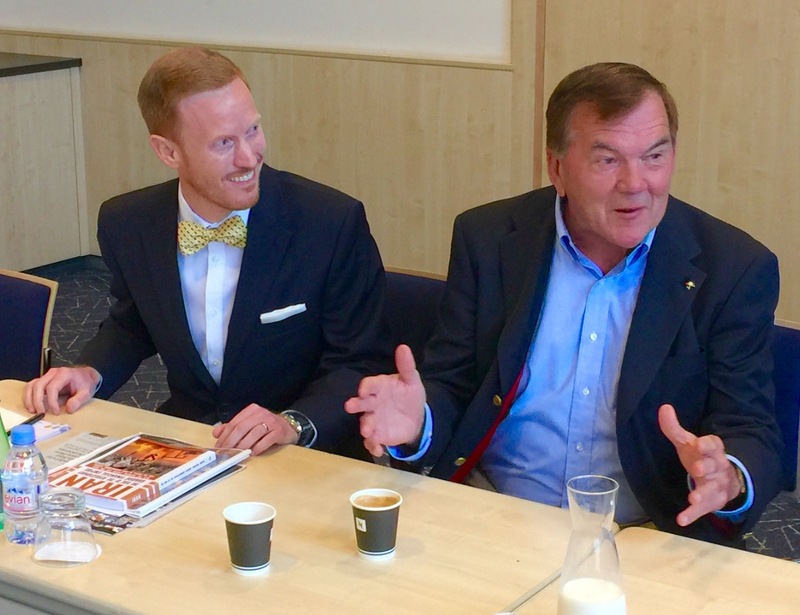 An invited guest of the organizing committee, Dr. Sheehan met with bipartisan U.S. officials during his visit to discuss Middle East policy as well as his scholarship on regime change. He also spoke at panel discussion featuring former Secretary of Homeland Security Tom Ridge and participated in extensive media coverage of the event. Topics raised by Dr. Sheehan in recent op-eds were also discussed by prominent U.S. and world leaders. The annual conference – which featured crowds estimated at more than 100,000 – is the largest annual gathering of the democratic Iranian opposition in exile and featured remarks by leaders from more than fifty countries, a bipartisan delegation of senior U.S. officials, and prominent academics from around the world. The Joint Comprehensive Plan of Action with Iran, democracy, human rights, the rule of law, and the deteriorating situation in neighboring Syria and Iraq were discussed. The events, which were carried live in the U.S. by Fox News and The Washington Times, were also broadcast inside Iran by Voice of America and featured prominently in Arab newspapers. Dignitaries in attendance included former Speaker of the U.S. House of Representatives Newt Gingrich; former FBI Director Louis Freeh, former Secretary of Homeland Security Tom Ridge; former U.S. Attorney General Judge Michael Mukasey; and former National Security Advisor to President George W. Bush, Frances Townsend, and many others. Prince Turki bin Faisal Al Saud, former Director of the Saudi General Intelligence Directorate in Saudi Arabia’s Intelligence Agency, pledged his commitment to regime change in Iran and expressed strong support for the Iranian resistance. Dr. Sheehan has written and spoken extensively on the concept of regime change in Iran in both scholarly and news outlets. Dr. Ivan Sascha Sheehan – Associate Professor of Public and International Affairs – is the Director of the graduate programs in Negotiations & Conflict Management and Global Affairs & Human Security in the College of Public Affairs at the University of Baltimore. For research or media related updates or to learn more about Dr. Sheehan, follow him at @ProfSheehan or link to his research profiles. In June 2017, Dr. Ivan Sascha Sheehan – Associate Professor of Public and International Affairs – authored two prominent op-eds on U.S. policy in the Middle East. Dr. Sheehan’s scholarship on regime change and the Iranian opposition has been influential in shaping Washington’s thinking on the potential for a democratic transition in Iran. The articles, which were shared thousands of times via social media and circulated in Washington’s policy community, raised themes that were subsequently picked up by prominent U.S. officials at international meetings during Summer 2017. Dr. Sheehan has been busy in June and July with writing, consulting, and participation in international forums. Learn more about a recent keynote address he delivered at a think-tank in Paris and stay tuned for updates on Dr. Sheehan’s involvement in a prominent U.S. delegation that traveled to Europe for the largest gathering for democracy in Iran, additional op-eds, and more. 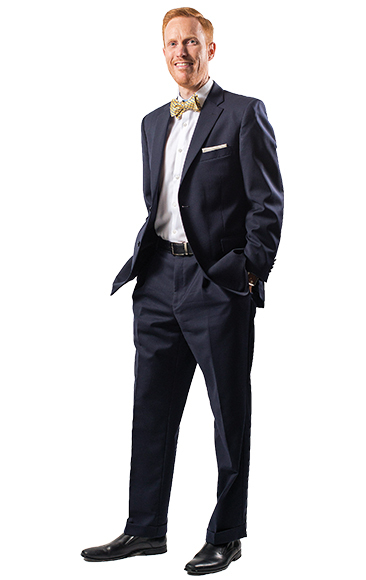 Professor Sheehan is the Executive Director of the School of Public and International Affairs at the University of Baltimore where he teaches in the College of Public Affairs.